This week we have a review A Murder of Mages by Marshall Ryan Maresca, along with an interesting interview with Marshall. Details at the end of this post on how to enter to win a copy of the book, along with a link to purchase the book where a portion goes to help support KRL & indie bookstore Mysterious Galaxy. A Murder of Mages is the first book in a new series by Marshall Ryan Maresca, but it is set in the same world as his debut novel The Thorn of Detonhill. The new series features the Maradaine Constabulary. Satrine Rainey is a wife and mother of two girls, who finds herself in desperate need of a job to provide for her family since her constable husband has suffered a horrible injury on duty which leaves him incapable of even caring for himself. Using the skills she gained while she was a spy, Satrine fakes her way into a job as the first ever female Inspector third class. She is paired with Inspector Minox Welling, an uncircled mage, who has been nicknamed Jinx because bad things always happen to his partners. Basically, they are put together because no one else wants them. On her first day on the job Satrine and Minox are sent out to investigate the body of a mage found in an alley staked to the ground with his heart cut out. This investigation puts them in Satrine’s old neighborhood where she grew up as a street rat, bringing back some unwanted memories. When more mages are murdered in the same fashion, Satrine and Minox find themselves in a race against time to find a serial killer before he strikes again. On top of that, Satrine struggles to juggle everything and keep her secret, while Minox finds himself struggling with his lack of knowledge about his abilities as a mage. Satrine is a wonderfully strong character who proves herself more than capable of keeping up with the men, as she has to deal with their prejudices against her getting this position. Minox is a complex and fascinating character who has always been a bit of an outcast, because he is a mage (in a world where they are not looked upon well), because he is uncircled, and because he is a bit socially awkward. Minox is absolutely brilliant, and makes me think a great deal of a young Sherlock Holmes. This book for me is the perfect combination of urban fantasy, magic, and mystery. I love a good mystery and when you can combine it with fantasy there is nothing I love more. The characters are real, and interesting and they make a great team. I can’t wait for the next book in this series, and now want to read Marshall’s other book. Marshall is a talented writer who has created a fascinating world! Marshall: I’ve been writing on some level for all my adult life, but I got serious about novel writing in 2007. That’s when I buckled down and figured out how to write a novel, and really devote time to getting them done. 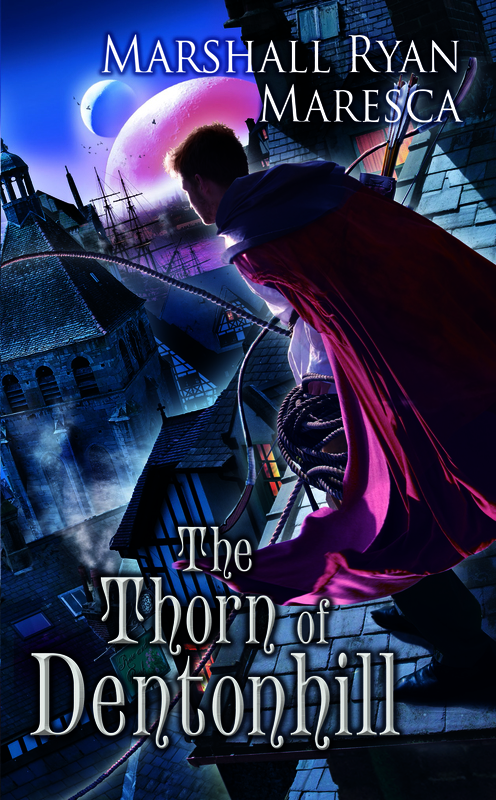 Marshall: My first novel, The Thorn of Dentonhill, came out in February. It’s a fantasy/superhero novel about a magic student by day and street vigilante by night. KRL: We actually reviewed that here in KRL. Have you always written fantasy? If not what else have you written? Marshall: Fantasy is my primary passion, but I’m also a big fan of science-fiction. I’ve been working on a few things in that area, plus I have a short story, Jump the Black, in the anthology, Rayguns over Texas. KRL: Please share about these interesting aspects of your life that were mentioned in your bio. You also have had several short plays produced and worked as a stage actor, a theatrical director and an amateur chef? Are you still involved in any of these things? 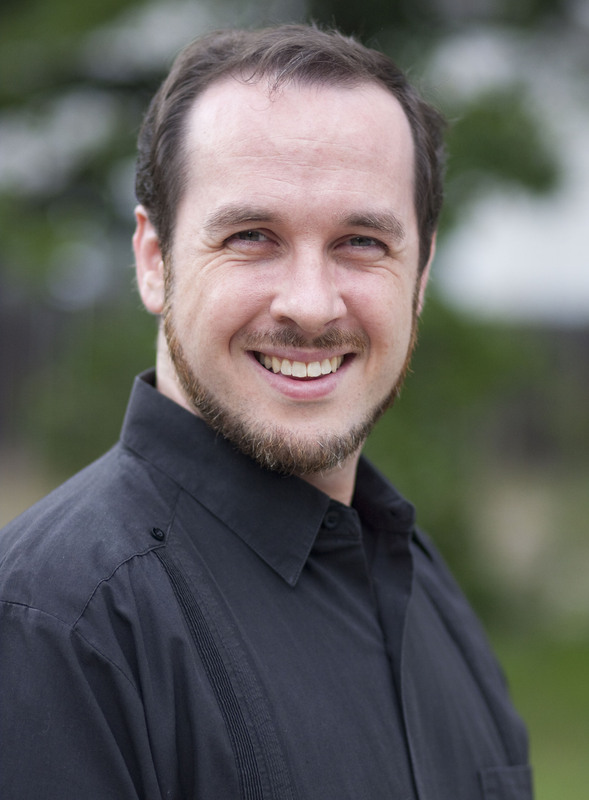 Marshall: My theatre days are mostly behind me. I haven’t been on stage for fifteen years. I miss it on occasion, but the truth is I was, at best, a decent actor and director. I still dabble with playwriting, enough to keep the skills sharp! KRL: How and why did you go from those to writing? Marshall: As I said, my acting and directing skills were mostly just decent. I could play a minor role or direct a play, and at best I’d not get in the way of everyone else. Also, that work cost me time, money and stress, partly with the logistics of production. I couldn’t afford to keep doing it, but I still had a creative drive that I needed to tap into. Writing was something I could do on my own schedule, in the privacy of my own home. KRL: What brought you to choose the setting and characters in your latest book? Please tell us a little about the setting and main character for your most recent book. Marshall: The setting –the city of Maradaine–is the same one as Thorn of Dentonhill. It’s a city filled with magic, intrigue, commerce, politics, scholarship and danger. The main character of A Murder of Mages is Satrine Rainey, an ex-spy and wife of a constabulary inspector. Her husband is beaten nearly to death, so to support her family she uses her old skills to fake her way into an inspector position elsewhere in the city. Marshall: Entertainment is my primary goal. That isn’t to say there isn’t further depth that can be found, of course there is, but I leave that for readers to find for themselves. I won’t dictate how they should read it. Marshall: I try to put in at least an hour or 500 words a day. Some days I fall short, others I go far past that. Marshall: Late evening is when the creative brain really kicks in. Marshall:Absolutely. It took a lot of perseverance and rewriting, submitting and rejection after rejection. But the process is a valuable one. I think it made a better work in the long run. KRL: Do you have a great rejection or critique or acceptance story you’d like to share? Marshall: I’ve got a long-range plan for the Maradaine books that involves multiple series. Marshall: There are a lot of writers I admire, whose work I really love, who I consider friends, but heroes? That’s kind of tough. Marshall: I do a lot of wide-scope world-building research, like studying different specific corners of history and anthropology, trying to construct a more complete picture of what a society and civilization looks like. For example, The Disappearing Spoon is about the history of the periodic table of the elements, but it gave me a lot of insight about the methods and politics of science and academia over the course of history. Mostly, for me, research is about just getting more “stuff” into my brain that I can shake around and use to create fuller pictures. Marshall: Like I said, I read a lot of non-fiction history and anthropology. I also love a wide variety of sci-fi and fantasy, especially anything that takes traditional trope and turns it on its ear. Oh, and my true guilty-pleasure reading: Star Trek novels. KRL: Ah a fellow Trekie! Anything you would like to add? Marshall: The sequels to both Thorn and Murder will be out next year. They are, respectively, The Alchemy of Chaos and An Import of Intrigue. KRL: I can’t wait! What is something people would be surprised to know about you? Marshall: Before I do a reading, my private warm-up is Nicki Minaj’s “Superbass”. Marshall:My website is www.mrmaresca.com and my twitter handle is @marshallmaresca. 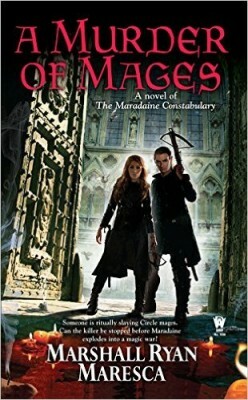 To enter to win a copy of A Murder of Mages, simply email KRL at krlcontests@gmail[dot]com by replacing the [dot] with a period, and with the subject line “Mages,” or comment on this article. A winner will be chosen August 8, 2015. U.S. residents only. If entering via email please include your mailing address. 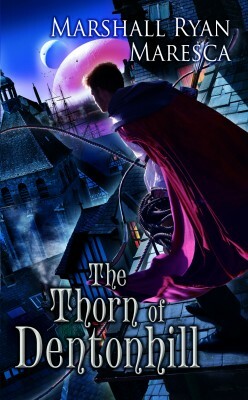 “The Thorn of Dentonhill” was a great introduction to this world, focused on the street-gangs and student-mages. “A Murder of Mages” gives us the law-enforcement side of the coin that was barely touched in the other book. This sounds like a great way to expand your view of the city of Maradaine. I’d love the chance you expose new teen-young adult minds to this series in the small, rural MS library where I’ve been working the last 6 years. Our patrons are big mystery fans so the fantasy setting will open up new venues for them. Thank you for this chance.